This is my first contribution for the Stamp Man ATC swap. I have not made an ATC for years and I have had so much fun playing with these again. This is my snowflake design. I covered a white ATC with antique linen DI and edged it with vintage photo. I sprinkled water over it to get the falling snow effect. I used TH stamps from the Reindeer Flight and Letter to Santa collection using aged mahogany and forest green DIs. 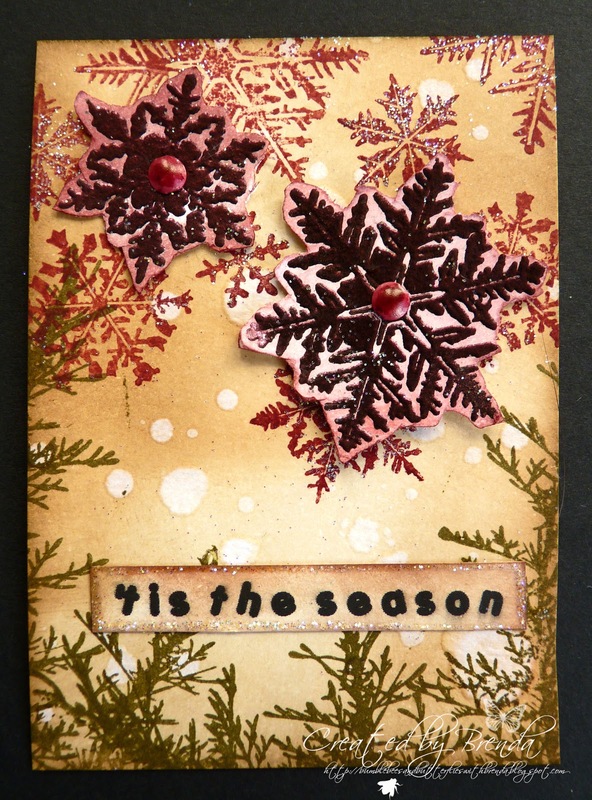 Lastly I embossed the snowflakes with Cosmic Shimmer embossing powder to get that shimmery effect and added them to the ATC with red brads and put some cranberry alcohol ink on them to deepen the colour more. 'Tis the season was made in a word document inked with antique linen and vintage photo and edged with stickles. Great fun and I had forgotten how quickly you can get pleasure and a feeling of accomplishment by making these. Come and join us in the swap. All you need to do is make a set of three of the theme for the month and send your swaps, with the correct postage on, in a stamped addressed envelope to arrive by the due date given. See the full instructions HERE. You will then get three swaps back at the end of the month and there is a winner too. Couldn't be simpler. I think I will be joining in with the swap, I would really like to get some little art back from other people. Wow!!! Love it. The forest moss colour makes the whole ATC come alive, soooo real looking Brenda. And the drips of water, lol, so effective! why don't I think of things like that! This really is very beautiful! Such a beautiful ATC, wonderful snowflakes. Terrific ATC, beautifully created Brenda! Love your use of color!